Our Christmas kitchen is always a fun place. The kitchen is a space I actually did not start decorating for Christmas until 2013. The Christmas kitchen is where a ton of Christmas magic happens from hot cocoa to baking Santa cookies on Christmas Eve. This year our breakfast nook will look different. We have new seating and are working on completing a farmhouse table not to mention the Antique Pie Safe that now resides in here. I am still brainstorming but I do know that I will be using our Johnson Brothers Old British Castles transferware in here this year. Be sure to stop back by on December 1 when I kick off our Christmas decor for this year with the reveal of our Christmas Mantel! Love the red in your kitchen. It just makes it look cheerful. 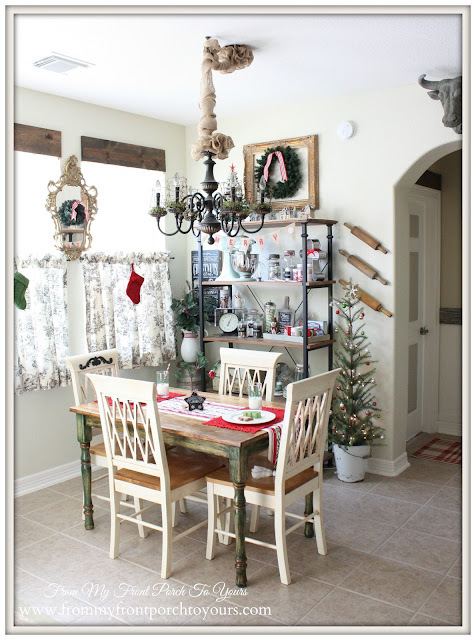 I always start my Christmas decorating in the kitchen and breakfast room. It is the heart of the home after all. Can't wait to see all you do! Hope you had a wonderful Thanksgiving. How festive and pretty! 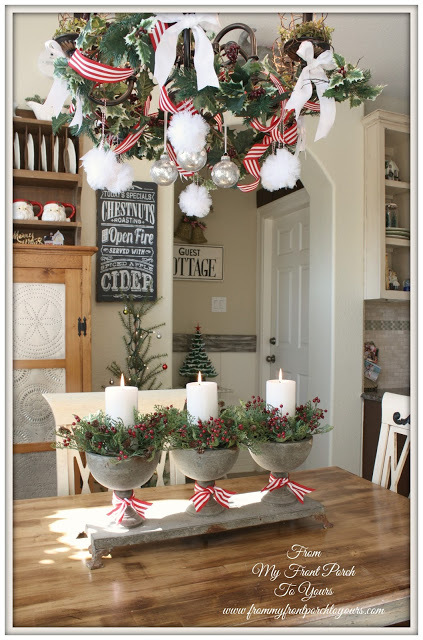 I didn't start to add the holiday decorations in the kitchen until a few years ago and I try to keep it in places like the window edges and nooks and crannies so it doesn't get in the way. You have the perfect touch, Pamela!